Thursday 31st looked to be perfect for cycling & inevitably as I arrived at Millennium Bridge for the Depart the pedestrian area was awash with about 30 cyclists obstructing said pedestrians who were attempting to go about their daily business unsuccessfully. I announced my intent to use the cycle path to get to Aldcliffe, but was interrupted by Mr Hutchinson who informed me it was flooded, to which I replied that I had ridden there the day before & could see no hint of flood. Unfortunately I had neglected to use a telescope for my recon' & by the time we got to Aldcliffe the excessive standing water was immediately discernable so plan B was adopted which entailed riding through the rough path above; as often occurs, 'the best laid plans of mice & Ken' went awry. Peter & Tracey joined us there having thought the Depart was from B & S as maybe they were already aware of the flood & assumed I wouldn't be so uninformed! Having informed Neil's cohort that we would be turning next left into Galgate I set off & waited for them to appear, once in sight I assumed they had seen me indicating left & carried on, unfortunately being a dwarf dressed in red they didn't see me & they carried on to Conder Green, however, by Galgate X roads we were all back together in disarray! As we approached Garstang Arts Geoff suddenly appeared on my right & thus the sprint for the sconeline began, I managed to hold him off as we locked the bikes up & was able to grab the one remaining scone, my one success of the day as it happened. 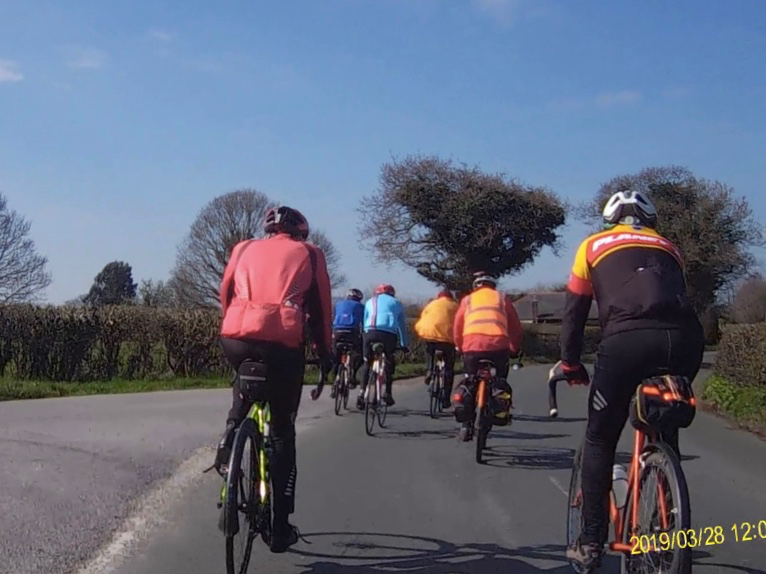 Upon leaving I lost 3 & gained 1, so still a sizeable group, I planned a long route around the Fylde & hence arrived around 2.00 pm to find the café so full of motorists that we had to sit outside on the veranda, but in warm sunshine this was no bother. We perused the menus which the waitress brought out for us & waited for her return, whilst all around us the people who like us had pressed on 2 pedals all morning (as they all drive automatics so as not to burden their left foot too much) were served before us. It was then we found out that we had to order our food at the paydesk, otherwise we would still be waiting for her even now; finally fed & glycogen replenished we set off towards Great Eccleston & the Cartford toll bridge, it is the 'privilege' of the ride leader to pay for all his & in my case, many, charges, thus I handed over the £27.80p for everyone & carried on towards the most tedious road in the word that is Pilling Marsh. I neglected to have an afternoon tea stop as my finances were by now summarily depleted & I have to buy everyone coffee & cake for my & Neil's birthday ride on 25th April, admittedly shared with Neil, then I spent the rest of the day in consultation with my bank manager who agreed to the loan providing he can come too & have double helpings, see you all at Arnside then!